I love candles and so does the old man. So needless to say I was excited when we got to try this candle warmer and candle. It was so hard to pick a scent but I have been really into Vanilla bean lately so thats the one I decided upon. I have never used an actual candle warmer before. I have warmers for the wax cubes from scentsy but I had never thought of actually heating the candles. This practice is called going flameless which you can find out more on the sponsors site here. I like the thought as I believe it may extend the life of my candles. Even more so I have a few candles that I hadn't thrown out that I love the smell of that were just too short to burn and now I can use them on the candle warmer and give them more life. I received the Auto Shutoff Candle Warmer for review along with the candle. The great thing about the auto shutoff is after 8 hrs it shuts itself off eliminating a fire hazard if you were to accidentally leave it on when you leave the house. There has been a few times we have come home to find a candle still burning in the house and to me the auto shut off just seemed like the best choice. We keep the warmer in the corner of the kitchen by the wall. Something I love about the warmer is that its so affordable that I could get one for every room in my house! This model retails for $7.99!!!! Thats better made for less than what you could get at say Walmart for instance. These warmers are also great if you plan on repurposing the jars the candles come in. It makes it a snap to melt the wax left inside when you're done so that you can empty and clean the jar. 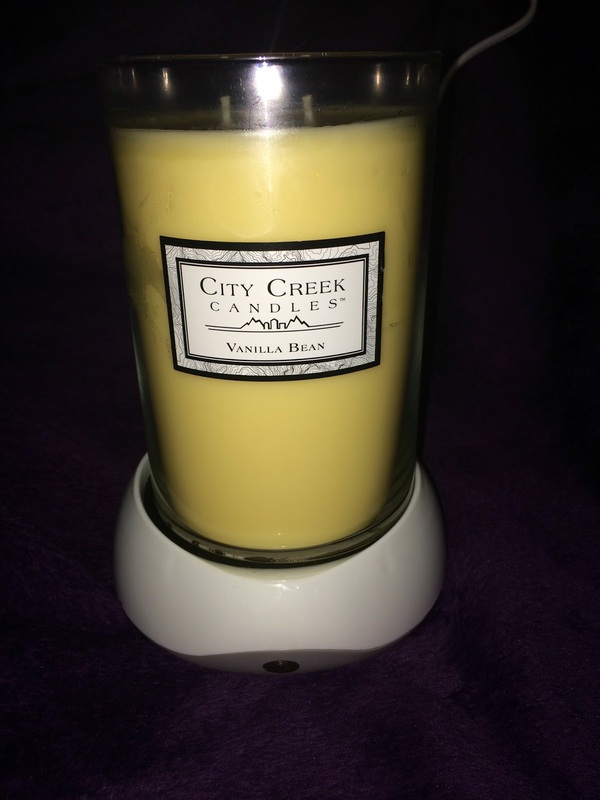 City Creek candle I received was in vanilla bean and it smells heavenly. The 22oz candle retails for $24.99 and has 2 wicks. You can choose to burn these traditionally on their own or to use with a warmer. This candle is not too strong and smells just right. I have used this at least 15 different occasions and from using the burner the candle still looks brand new! 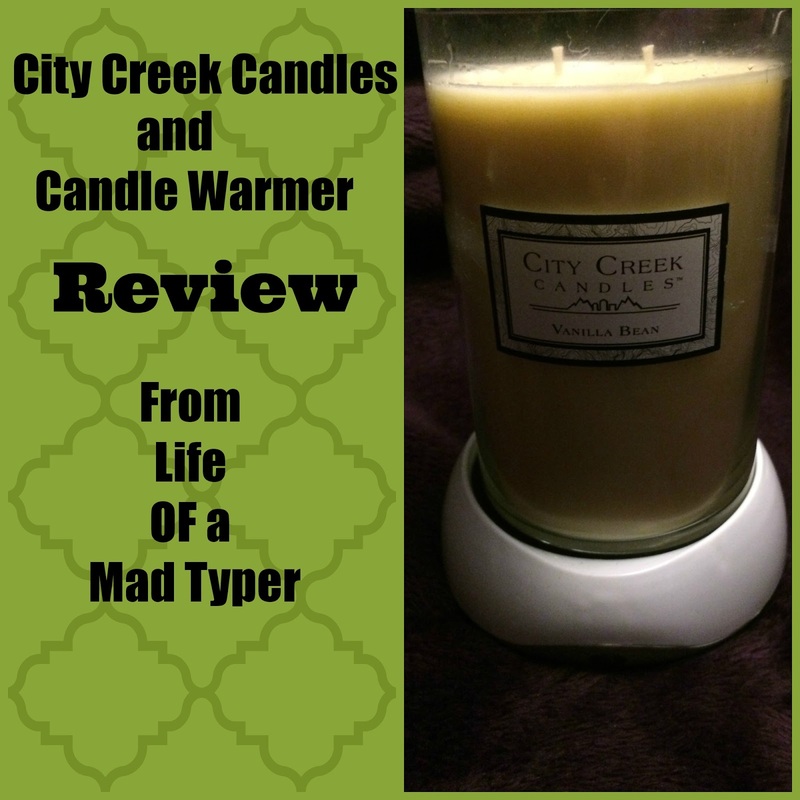 I love my warmer and candle and I think you will too! Great news! Giveaway starting on the 10th! !